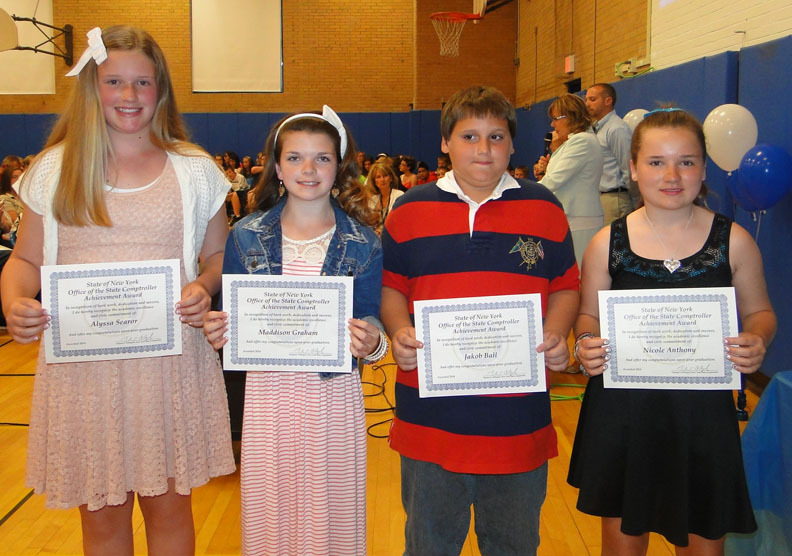 OSWEGO, NY – The sixth graders of the Fitzhugh Park Elementary School celebrated their final days at the east side school with the annual recognition ceremony. 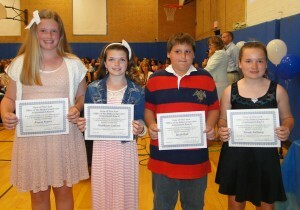 Award winners at the Fitzhugh Park Elementary School sixth grade honors ceremony included four students who earned the New York State Comptrollers’ Award and included Alyssa Searor, Maddison Graham, Jakob Ball and Nicole Anthony. The highlight of the afternoon came as each student received their certificate in recognition of their accomplishments. However, there were several special awards that were also presented. Alyssa Searor, Maddison Graham, Jakob Ball and Nicole Anthony received the New York State Comptroller Award while the “Triple C Awards” signifying character, courage and commitment from the New York State Attorney General were presented to Hannah Holland and Riley Randall. Once again the Rose Izzo Writing Award was presented to an outstanding Fitzhugh Park Elementary School sixth grader. 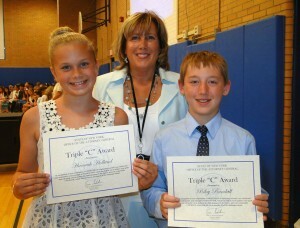 Recipients of the State of New York Office of Attorney General Triple “C” Awards at the Fitzhugh Park Elementary School were Hannah Holland and Riley Randall who received their certificates from FPS Principal Donna Simmons. The award, introduced several years ago by the Izzo family, is presented to an outstanding writer among the FPS sixth graders. This year, Alexis Johnson was the recipient. Great-granddaughter of Mrs. Izzo, Samantha Falcetti, presented the award and was joined by FPS teacher and family member Holly Allen. Principal Donna Simmons was joined by the sixth grade teachers in presenting certificates to the sixth graders. This year’s sixth graders from Carol Carroll’s class who are now bound for Oswego Middle School include Brandon Beshures, Taysha Colon, Jade Comstock, Bradley Cuyler, Matthew Cuyler, Hailey Dunsmore, Megan Enos, Aaron Hibbert, Dylan Hill, Grace Hoffman, Mitchell Hudson, Thomas Lee, Keilaya Leyva, Alyssa McLymond, Avery Monahan, Deklen O’Connor, Michael Riley Jr., Tristyn Shortt, Brian Solazzo, Sabrina Swank, Stephanie Wager and Jaden Wyman. 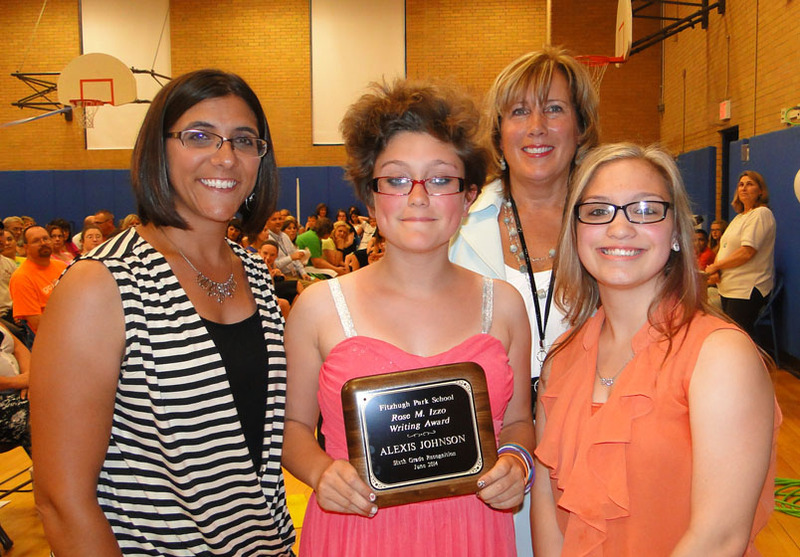 The Rose Izzo Writing Award was once again presented to a Fitzhugh Park Elementary School sixth grader. Alexis Johnson was this year’s recipient as she was joined by Izzo family member and teacher Holley Allen, FPS Principal Donna Simmons and Rose Izzo’s great-granddaughter and former FPS student Samantha Falcetti. Also moving on from Chris Haessig’s class are Aubrey Atkins, Jakob Ball, Monet Barnes, Christian Butler, Noah Delaney, Jordan Engler, Michael Farley, Zachariah Gonzalez, Maddison Graham, Benjamin Holbrook Jr., Alexis Johnson, McKenna LaSalle, Karsyn Mahaney, Gracelynn O’Connor, Collin Perry, Hannah Reed, Alyssa Searor, Natalia Trapasso, Kaylyne Westberry, Valerie Whitford and Courtney Wood. The others, from Josh Lerch’s class, who will start seventh grade this September are Nicole Anthony, Elijah Campbell, Ezra Clemons, Sarah Cory, Gavin Earle, Jeffery Fragale, Tyler Griffin, James Hibbert-Nelson, Hannah Holland, Sara Johst, Steven Jones, Madison Malone, Sadie Motell, Hugh (Riley) Randall, Mark Ryder, Hailey Sawyer, Hunter Smith, Katie Swinson, Grabriela Valentin, Alexis Vivlemore and Brandon Wise.